Wedding in the Philippines can be very expensive. A lot may think that it will only cost 50-75,000pesos but from the preparation to the post celebration, a typical Filipino wedding with the hotel, ceremony and reception can cause you up to 200,000pesos. By culture, the man (and his family) will have to spend more than the girl. However, in the modern times, most wedding budget is between the couple. This is the reason why agreeing to a wedding budget is important. The first step in order to thoroughly have a baseline on the amount you want to invest in your wedding is to assess what the dream wedding of your beloved is. It is still true that a wedding is a bride’s thing but most groom nowadays have specific requests for the design and the design. You might want to have a coffee with your fiancé and just find an hour or two to understand what the dream wedding of the other side is. Discussing it first and foremost can eliminate a lot of worries and dilemmas because you can also find yourself agreeing to one central theme. Upon agreeing to a theme, you can now estimate how much the wedding could cost. If you agreed for a destination wedding in Tagaytay or Batangas, you know that it will cost you as much as 300,000pesos for all of the transportation fees (every supplier will let you handle their transpo!!! ), accommodation and so on and so forth. If the agreed theme is a beach wedding then you will also have a nice balanced follow up task to research on the best beach that caters a function like yours. There are also those who just both agree that they want a simple and intimate wedding. This on the other hand save you a lot of money in the long run. Don’t throw a big wedding if your current budget is not enough. Impressing others will never do good. Try to be realistic in what you already have. I’ve been in a wedding that’s low budget but because the bride and the groom keep the celebration sincere. At the end of the day what matters most is that you are marrying the love of your life. Research the common wedding cost from each supplier near your area and work on how much you really want to spend. If you have a current limited budget, try to ask for help from your own parents, your fiance’s parents and friends around you whom you know can help big time with all the wedding needs. You may have a friend who is very good when it comes to graphics, ask him if he will be willing to help designing the invitations. Make sure that you are prioritizing every spending that you do for the wedding. This Thursday I’ll be talking about the 5 Wedding Suppliers You Need to Invest Big Time so you’ll have an idea where to really give importance to in terms of wedding budget. The best tip so that you and your fiancé can easily agree on a wedding budget is to first and foremost, UNDERSTAND EACH OTHER. Let the other know what your financial capability is. Do not be in debt just to satisfy the luxury of a wedding. There are far more ways to cut off and the best key is to SAVE the moment you know the person you are being in a relationship with is the person you want to spend the rest of your life with. 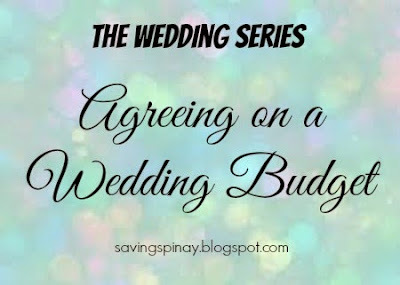 In summary, if you want to agree on the right wedding budget you have to consider your other half’s expectations on the wedding. Then acknowledge how much your currently have so that you have a benchmark to follow. Lastly, make sure that you are willing to understand each other’s needs. You don’t want a big fight before the big day, right? !